Lessons that are specifically made for you and where you are at. Competence starts with understanding your environment and how you relate to it. Understanding how the water moves so you can paddle efficiently and go further with less effort by not moving water. Understanding how your body naturally wants to move, so you feel powerful and don’t get sore and tired. Understanding how to wear your kayak so it moves with you as an extension to your body, so you move together with easy instead of using force. 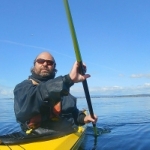 Understanding how your paddle interacts with the water to move you faster, and also give you the support you need to avoid capsizing when paddling in rough conditions. You can learn to kayak without paying much attention to how everything moves and relates to you, but it always feels harder. And you never reach the same level of mastery. These lessons start with where you want to go. What you want to do with your kayak. And from the perspective of understanding the paddling environment, you learn to move with it with ease and elegance. What a day! Many thanks to Paulo for customizing a lovely tour with our friends. He guided us through the prettiest coves of the Chain Islands to a perfect lunch spot on Discovery Island. Wildlife galore! Paulo’s an easy-going and knowledgeable guy. Don’t miss this trip. I spent 2 spectacular days in Victoria taking lessons from Paulo. First the setting is unbelievably beautiful. The trip would have been worth it if only for the scenery. The lessons made it all the better. I have purchased many online classes from Paulo and really liked his approach. I am not a beginner, so we worked on more subtle stroke, brace and roll issues. I’m a surgeon and when teaching teaching senior residents it is not the basics but better techniques I focus on. I felt like one of my students getting critiques and advice on better techniques. I got a lot of practical feedback. I’d do it again in a heart beat but its a long trip for me. If you get a chance to take a lesson from Paulo take it, its a great experience. Thanks Paulo for a great time.